It’s not often I see stories about Xiangxi, that part of western Hunan where I lived for nine years, so I want to share this one with you. The writer is Deng ChaoChao, who works with impoverished villages in the Chinese countryside, including Mendaicun 们岱村 west of Jishou. I’ve marked it on the Google map above. Writing for Sixth Tone, an online magazine in China, she describes the cooperative ventures her NGO has helped villagers create to augment their meager incomes. She also mentions working with university students on a service project. I wonder if those students are from Jishou University. While I have never visited Mendai, I have visited Paibi, which is not far away as the crow flies. 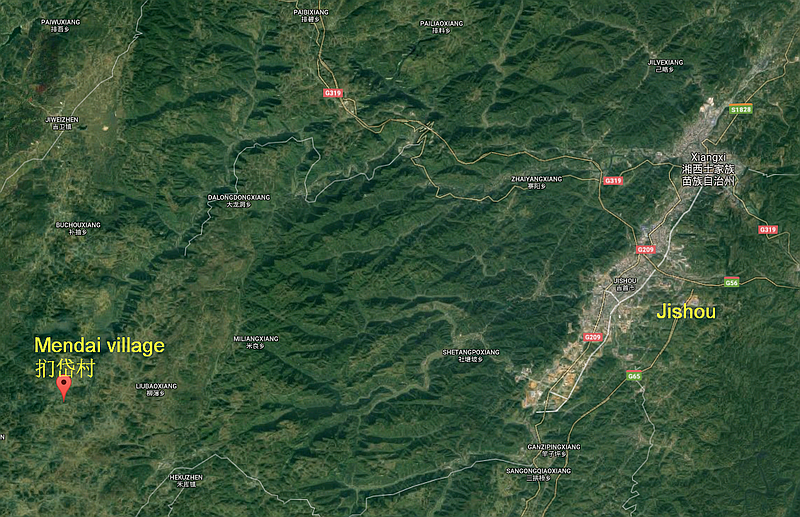 It’s on the northern edge of the map above (labeled Piabixiang). I wrote about that visit last July. I was visiting a school in a town, and not a rural village, though. I won’t reproduce Deng ChaoChao’s article here, for copyright reasons, but here is an excerpt. Early this year, a group of university students visited the village as part of their research work. One of them remarked that the villagers were not poor at all. After all, this student said, they had televisions, telephones, rice cookers, and cooking oil — what else could they need? Continue reading at Sixth Tone. Incidentally, Sixth Tone has many interesting and surprisingly frank stories about Chinese society, politics and culture. Well worth a visit if you have the time.